3 Coats NOPI Am I Making Myself Claire? The weather is rainy and gray, and my nails aren't really helping. To be fair, I've had this polish on since yesterday, so I've only got myself to blame for not switching to a brighter, cheerier shade! Am I Making Myself Claire was part of NOPI's Modern Family collection that came out in January 2013. She's Lily Something was also part of that collection, and the only polish I picked up at the time. This and Alex By The Books were on clearance at KMart recently for just $2 a bottle. How could I say no?!? Application was a breeze, too! Three thin coats, and no streaks to be seen! 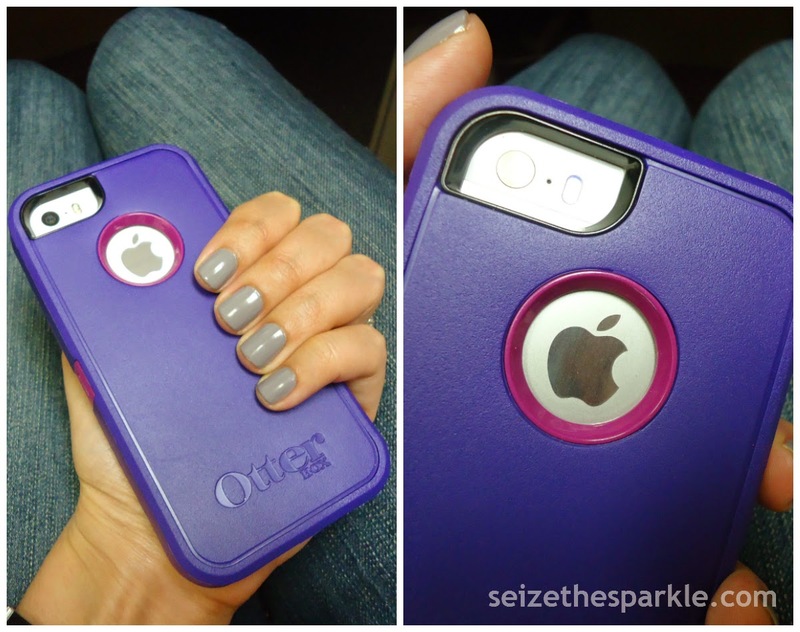 At 2 coats, my nails were still a little patchy, so the 3rd was definitely necessary for me. Am I Making Myself Clairs is a slightly gray-tinged, red-leaning lavender. It's a really pretty shade... Kinda reminds me of the Zoya rose-toned neutral polishes that came out earlier this year. I also like that it doesn't look incredibly harsh or chalky. Pastels tend to do that sometimes! Did you pick up any of the Modern Family NOPI polishes when they came out? Or did you pick them up recently, like me?!? Shimmery pastels seem to be a thing this Spring. I can't say that I mind! 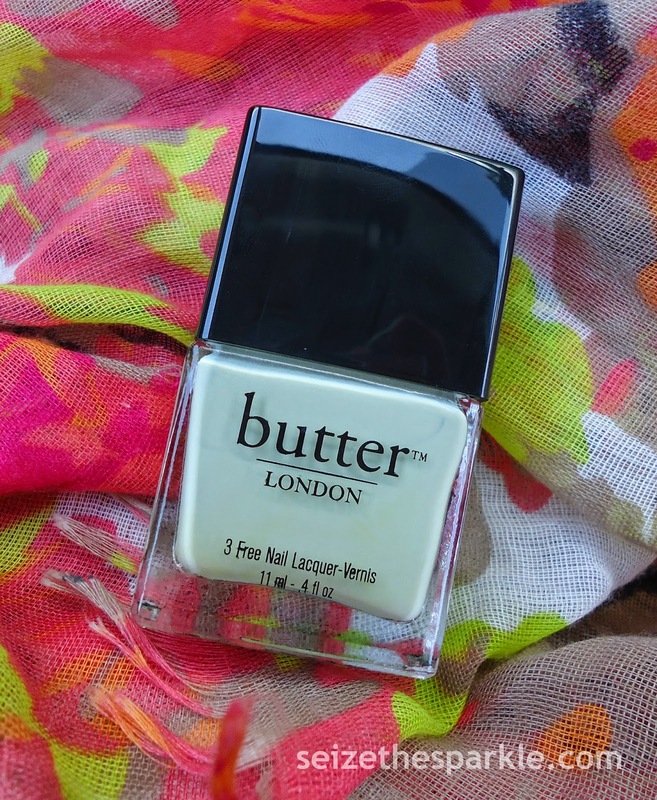 It's a fun way to liven up pastels, and tends to cut down on the chalkiness and streaking that pastel polishes are prone to. Amanda from Pretty Girl Science posted about this shade the other day, and I knew I had to find it! So, while I was polish-binging at K-Mart, I picked up a bottle. I'm not sure if it's just my K-Mart, or if it's the whole beauty clearance they have going on, but this display was precariously balancing on a high, sloping shelf. I was a little afraid that the whole thing was going to come toppling down on me, because me and coordination do not the greatest coupling make. 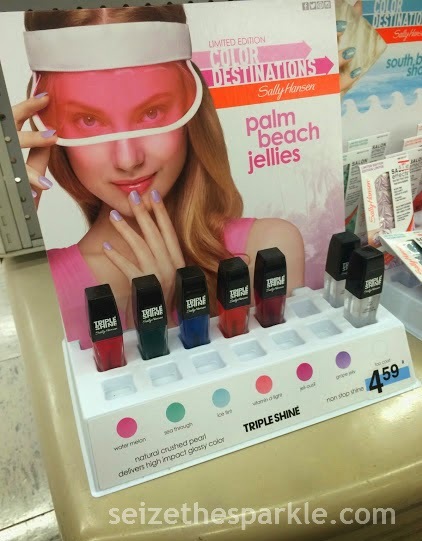 I'm not sure I understand my local K-Mart's display system at all... Maybe they don't have a nail polish enthusiast working there? Or maybe they do, and that's why all the new and good stuff is always hiding or in strange locations? I couldn't tell you... Now where was I going with that? 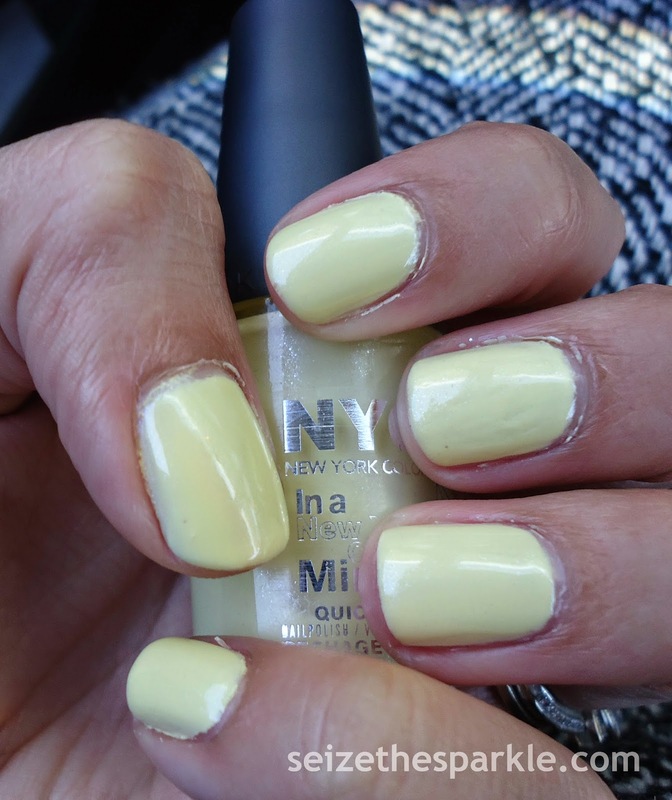 So, Mimosa Bouquet is a pretty pastel yellow with a very fine silvery shimmer running through it. Sinful Colors has been adding shimmer like this to a lot of their pastels this season. (I'd like a pastel lavender with gold shimmer when anyone gets the chance... kaythanks!) The shimmer does help cut down on the chalky appearance and streaking that pastels can have, but not completely. Mimosa Bouquet isn't a streaky mess or anything, but I do notice small streaks on some of my nails that I would prefer weren't there. Oh, and the nail on my middle finger was totally my fault. I tried to fix a smudge without starting all over, and it totally didn't work! What do you think of Mimosa Bouquet? Originally, I thought about layering with Sea Through... but I have this tendency for pinks and purples. Also, I just picked up NOPI Sweet Dreams, and the teal, purple, silver glitter combo called out for Grape Jelly much more strongly than Sea Through. I put a movie on Netflix and started painting coats, and painting coats... and. painting. coats. I honestly have no idea how many coats of Grape Jelly I used before and after the glitter... I know it was more than what I used in Jelly Pirouettes. Honestly, I remember getting to 5 or 6 coats and thinking that Grape Jelly was still reeeeeaaaalllllly sheer, and maybe I should take it all off and try something else. But, eventually, the purple built up to a stage where I decided I could add in a layer or two of Sweet Dreams. And I did. Exactly 2. Then, it was back to Grape Jelly. (Just keep painting, painting, painting...) I'd say at least 5, probably no more than 10, but I'm not sure. (like, at all.) I probably could've kept going, but I was getting tired, and wanted to go to sleep... I slapped on a coat of Seche Vite and called it a day. It really doesn't look like it. I've put layers and layers on to make some pretty impressive jelly glitter sandwiches in my day, and trust me, they usually look like there's a zillion layers. Not with the Palm Beach Jellies, though. That's not really good or bad... just a little factoid I thought I'd throw out there. And... before I forget! K-Mart was having a pretty huge clearance sale in their beauty department last week when I stopped by. I scored Sweet Dreams from NOPI for just $2! Definitely check it out... they had a pretty decent selection! What do you think of Grape Dreams? 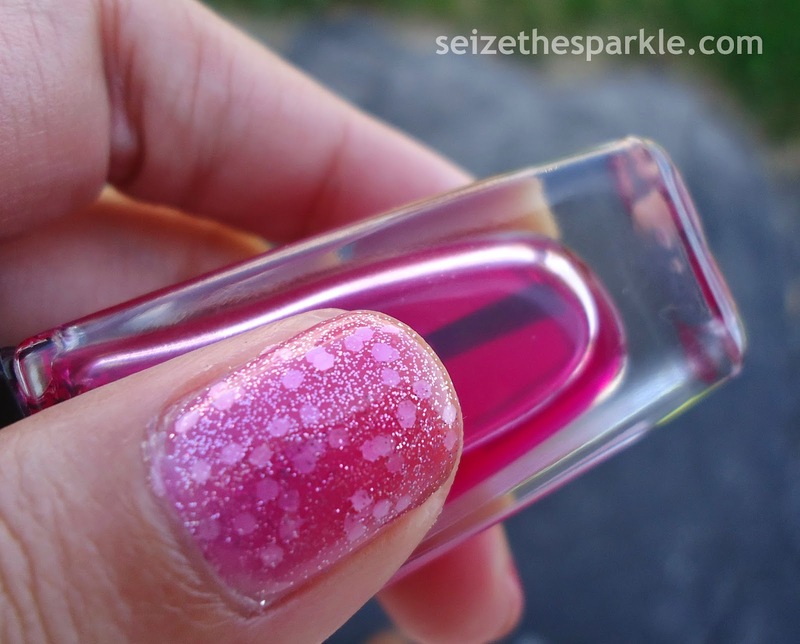 5 Coats Sally Hansen Jell-ous? 4 Coats Sally Hansen Jell-ous? Yes... I currently have 14 coats of nail polish on my nails. But look at all that glittery jelly goodness! 14 coats isn't really so bad... is it? I mean, when it comes to Jelly Glitter Sandwiches? In addition to being incredibly sheer, I heard these were thick, not fun to work with, took a long time to dry... There's been a lot said about this little collection... BUT... I think all of those critiques actually helped me to be more patient with these little gems. So, how did I do it, you ask? I took my time between coats. Like, really took my time. This whole layering took a little over an hour from start to finish. I didn't really time it out precisely, but I'd say I probably waited anywhere from 2-5 minutes between coats. Also, I was super careful. I was pretty determined to see how this polish would look in a jelly glitter sandwich. Honestly? I really like how this layering turned out. Totally appropriate for Spring! In terms of jellies... Jell-ous? is really unique for my collection. It's definitely a mid-toned petal pink shade compared to the more pigmented hot and berry pink shades I already own. So that's always nice! I've read in other reviews that this whole line of polishes contains a super-fine micro shimmer, but I didn't really capture it in my photos. I can't say I really noticed it in person, either. I blame that on all the glitter in Pirouette My Whistle! What do you think of Jelly Pirouettes? And then I saw them in person. (To buy! To buy!) I've been scouring my local CVS and Rite-Aid stores for a few weeks now! I actually found these not-so-prominently displayed at my local KMart. 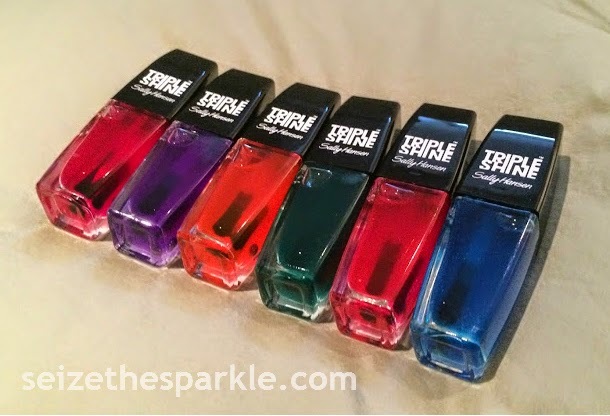 l to r: Sally Hansen Triple Shine LE Palm Beach Jellies in Jell-ous?, Grape Jelly, Vitamin D-light, Sea Through, Water Melon, and Ice Tint. Welcome to the stash little translucent jewels! Have you picked up any of these Palm Beach Jellies? Hypnautical houses blue and green opalescent glitter sprinkled with green to blue flakies in a translucent teal base. It added quite a good deal of depth and range to the layering! But, you know me... 1 coat of anything is never enough, so I went back and added a second coat of Last Friday Night, and then another coat of Hypnautical to really get the glitter going. To top it all off, I used Miss Pixie, the blue jelly from L'Oreal's Miss Candy Collection. For about half a minute, I thought about using Zoya Frida and turning this into a teal jelly glitter sandwich, but decided against it. I'm glad I did, because I really like how this turned out. The longer I wear it, the more I like it! My favorite thing about this layering is the fact that despite 5 coats of glitter polish and 1 coat of seche vite, Pacific Blue is still incredible vibrant. Since I used opalescent glitter, at some angles, you just see the incredibly bright cobalt blue... but at other angles, you get a really nice flash from the glitter and the flakies. What do you think of Pacific Hypnautical? Originally, I had planned to turn It's All About Me into a jelly glitter sandwich. But the chips just didn't fall that way... It was just polish that chipped off my middle finger, but I actually managed to chip a tiny chunk of nail, polish and all, off of my pointer finger. Both were on my rarely photographed right hand, but still. I had to file all the nails down to match Pointer, so I figured I'd just put on a new shade of polish while I was at it. 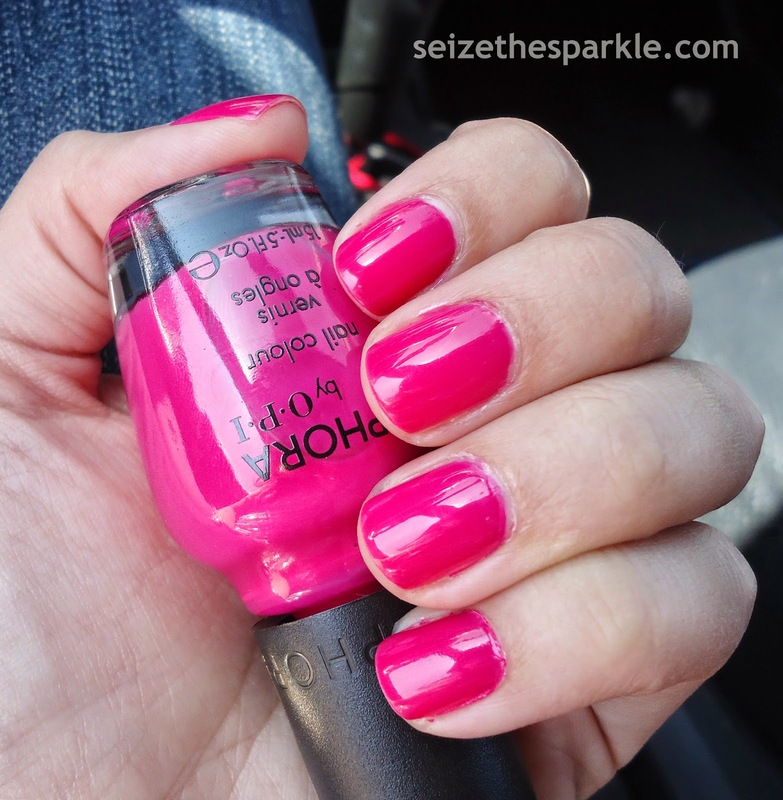 Frankly I Don't Give A-dam is another SOPI polish I scored from Big Lots for $1.80. 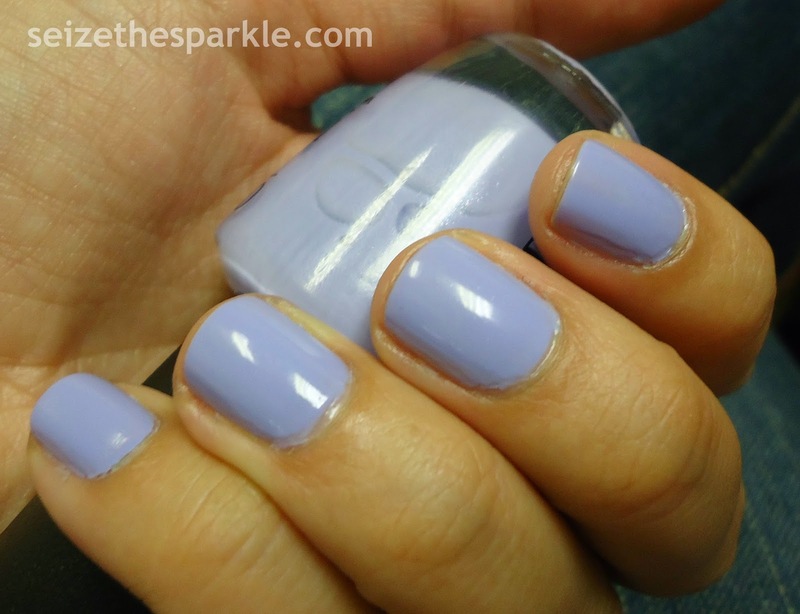 It's a gray creme polish that doesn't lean a little towards the blue side, and it's not a grurple. It's just plain old gray polish, but it's super shiny and kind of springy, even if it is gray. I love gray polish for the same reason I love black polish... it goes with everything. If Spring had a "new black"... gray would so be it. I've finally found my purrrrrrrfect pink. No really, this time, I swear I did. I know I've said the same thing the past 9 times... but this... thiiiiiis is thee one. (Seriously!) Presenting... It's All About Me! I purchased this polish at Big Lots, while they still had a decent stock of SOPI polishes. There were a good deal of these in stock for a little while, but they definitely went fast. What can you really expect? Mark down a $9 bottle of polish to under 2 bucks and it does funny things to us polishaholics! 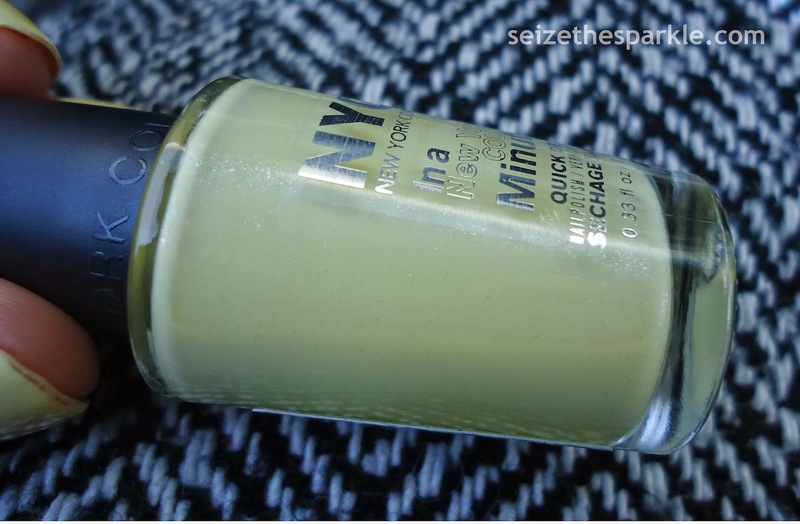 I picked this up and put it down so many times, thinking that it had to be a dupe for a polish I already owned. But, you know me, I finally broke down and brought it home to meet the rest of the stash. I needed something bright on my nails after so much pastel this past week, and It's All About Me was just begging to be used from inside its shrinkwrap. Can I just say now, that I regret not buying every.single.bottle? The finish on this really surprised me. It's not as much of a jelly finish like Do You Think I'm Tex-Y? from OPI... but it's also not a creme finish like OPI Conquist-adorable Color. It's a similar raspberry pink shade with a finish that isn't jelly, but it's not what I would consider to be a crelly finish, either. I think my VNL is a bit more visible with It's All About Me than your average crelly. You guys... I was sooooo surprised by this polish, and I love a good, unexpected surprise. I know last year's color of the year was Emerald Green, but it might as well have been Mint Green. Everywhere you looked... there was mint, totally soaking up its moment in the sun. Spring and Summer 2013 were FULL of it, and honestly, the forecast doesn't look too different this year. Pastels are always big in Spring, a breath of fresh air after all those vampy shades and neverending snowfalls. 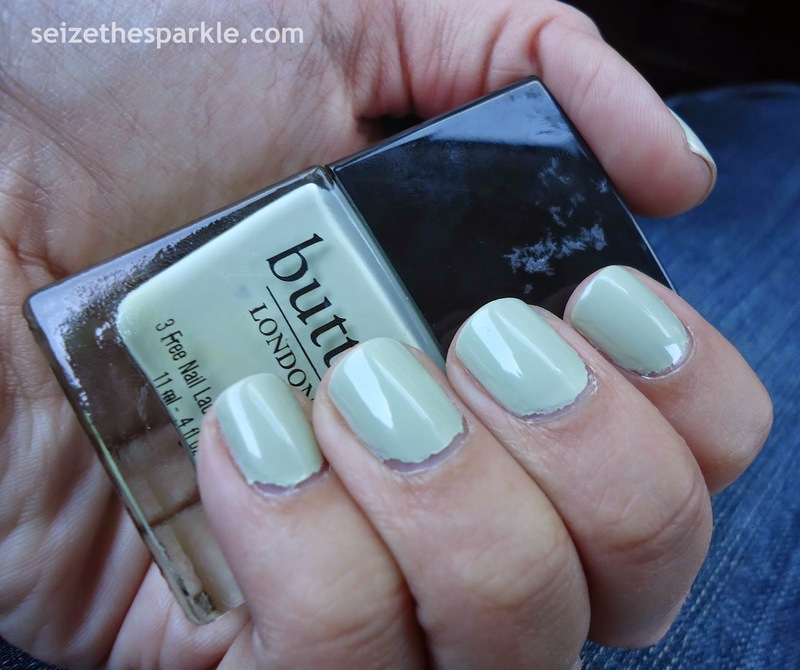 Bossy Boots is a celery green creme polish, and it reminds me of a GAP bookbag purse I had in high school. That was also celery green, and believe it or not, I had socks that matched it perfectly. (Don't even get me started how I totally used to wear birks with socks like it was going to catch on or something. ahem, FETCH*.) Celery Green is a pretty color, and I really like this shade on me. It's a leafy yellow-leaning pastel green that reminds me of the pastel green... (Tantrum, I think?) in the original Hard Candy polishes from the 90s that I could never find. You know, the ones with the cute gummy rings? Anyway... nothing says Spring like a little pastel nostalgia. Pastalgia**, anyone? What do you think of Bossy Boots? * FETCH = not going to happen. like.ever. 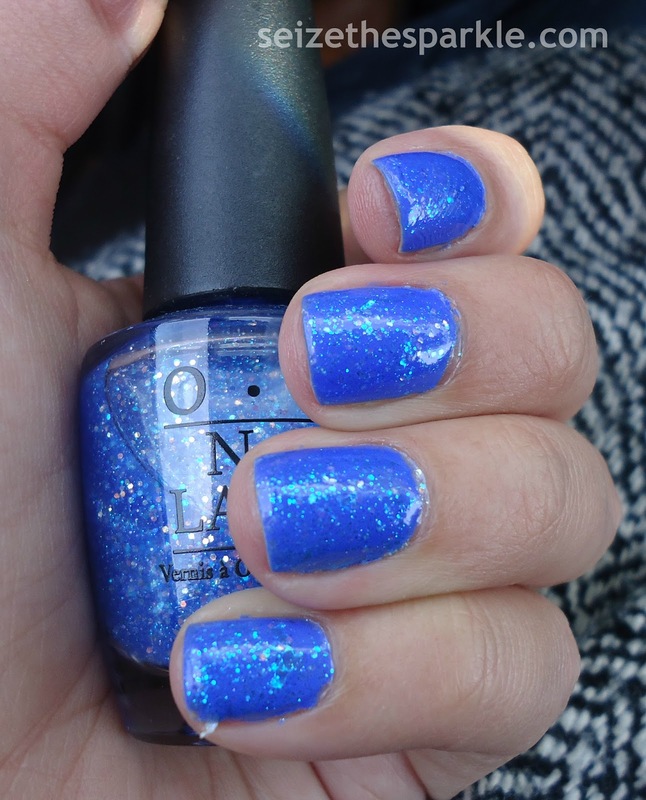 Remember when I was talking about how Violets Are Blue from Sinful Colors wasn't named well? I can't say that I'm super thrilled with the name of this one, either. I mean, I don't hate it, but I am partially Hungarian, so I say Budapest the right way... Budapesh, not Budapest. You know what was pesky about this polish, though? Properly photographing it! Man, was that difficult! I took pictures inside and outside, with my CyberShot and my iPhone. 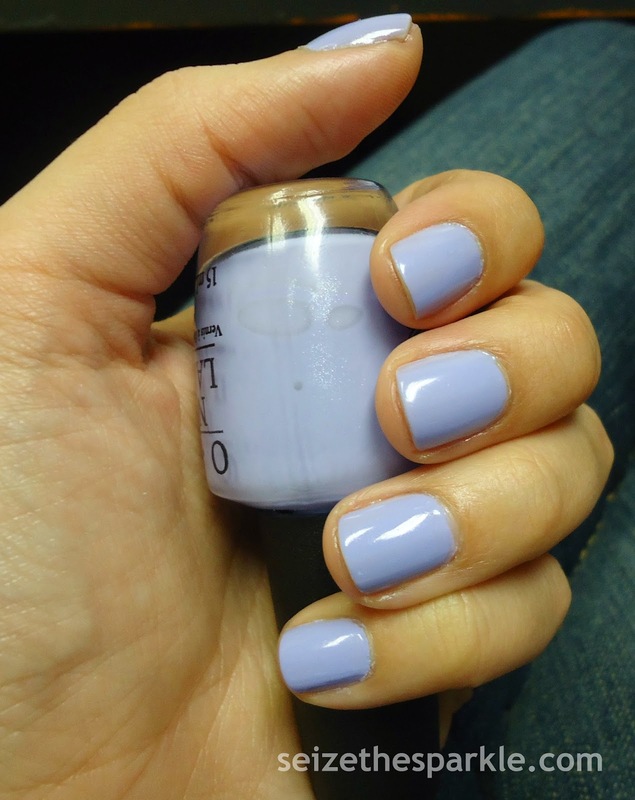 Outside, this polish didn't want to have anything to do with the idea of being lavender, violet, lilac, or purple. It just wanted to show its blue side, and that.was.all. Inside, I was able to capture it a little better, but it still leans a liiiiiiittle bit more towards the purple side in real life than what you see in my photos. You're Such A Budapest has a really fine shimmer that's visible in the bottle, and you can sort of see it on the nails. You have to look really closely for it, though. I think it's mainly there to soften up the look of the polish. Pastels can go chalky so easily, and a superfine shimmer in silver or gold can really help to avoid that. 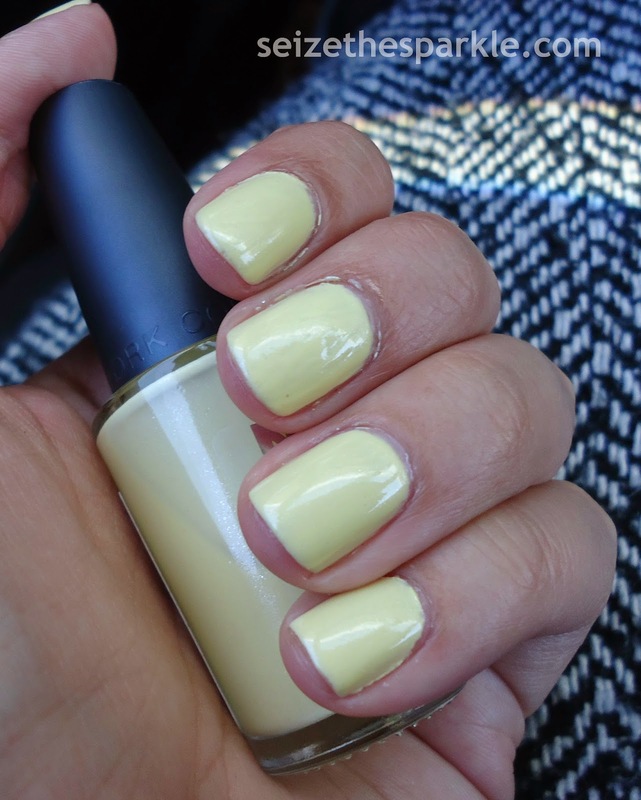 Originally part of the Spring 2013 Euro Centrale Collection, I bought my bottle from Sally Beauty Supply, and it seems to be a part of their core OPI collection. What do you think of You're Such a Budapest? Nicole By OPI Am I Making Myself Claire?